Mandolin Brothers is aptly described as an American institution. This Staten Island, New York store is not only a home where high quality and vintage instruments are sold but where a passion for music still reigns supreme in the heart of founder Stan Jay. “We are passionate about the music that results when a fretted instrument is played in a facile and melodious manner. If there is anything prettier than a soloist who performs instrumental or self accompanies, it is the sound of two guitars played in harmony”, says Jay. It’s this type of intimate connection to the music as both art and expression that sets aside Mandolin Brothers as an international destination for musicians. Described by many as a kind of mecca for players of everything from guitars to ukuleles, dobros to, of course mandolins. Mandolin Brothers has been a source of instruments for a literal Hall of Fame of musicians the likes of Joni Mitchell, George Harrison, Paul Simon, Bob Dylan, Bela Fleck and Paul McCartney too name a handful. So much has been said and written about Mandolin Brothers that to describing its singular importance is impossible. And to list its significance would be a considerably lengthy exercise. 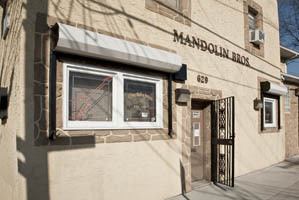 One thing is clear – as one of the most discerning experts in acoustic instruments, Mandolin Brothers counts Guild Guitars as one of its stalwart residents. The Guild’s live in a room called the “G” room. A room reserved for Gretsch, Gibson and Guild. In an interview with Stan Jay, he states “The year 1976 brought many changes for Mandolin Brothers. That was the year Joni Mitchell visited, selected, and was inspired on the way back to Manhattan on the Staten Island Ferry to write her autobiographical “Song for Sharon” – a track on the Hejira album that told the world that she had come to Staten Island to buy herself a mandolin. In that year we moved our young company out of its original digs in a second floor walk–up in the waterfront section of a seedy neighborhood called Stapleton and bought an unlikely looking stucco building in the established, commercial area known as West Brighton, and turned it into a showroom. We had never, to that time, offered any new instruments – only, up until then, the highest quality vintage pieces, and so the first thing we did was to get in touch with the big three fretted instrument companies – Gibson, Guild and C F Martin – and apply for dealerships, all of which we acquired. Every player would do well to make a pilgrimage to the hallowed halls of this grand dame of music shops, if only to stand in the shadows of the music that has been created from advice and passion of the people of Mandolin Brothers. We would all do well to show our respect and admiration for the part they have played in the music we love. What are you most passionate about at Mandolin Bros? We are passionate about the music that results when a fretted instrument is played in a facile and melodious manner. If there is anything prettier than a soloist who performs instrumentals or self–accompanies, it is the sound of two guitars played in harmony. Another delight is the sound of an ensemble – did’ja ever listen to a mandolin quartet – mandolin, mandola, octave mandolin and mando–cello? It’s one of the most haunting sounds as has ever filled a room (remember – large numbers of talented amateurs were playing this way from the late 19th century to the early 1920s – mandolin orchestras were as prevalent as garage bands were in the 1980s). Add your common, typical, everyday mando–bass or just an acoustic or electric bass guitar to any of these combinations and you have instant Nirvana. For me it’s all about the music, and it always has been. Of course, being the “go to” place for any question having to do with the history, valuation, repair or acquisition of fine American guitars, banjos, mandolins, ukes and electric basses is also one of our fondest roles – we like helping people and spend most of each day doing just that. What matters most to guitar players/buyers of today when they are looking for a new guitar? A new guitar has to be well–made, of fine materials, utilizing construction techniques that will, decade after decade – for a hundred fifty years or more – allow the instrument to play comfortably in every fret position (without buzzing). It has to be fully adjustable – the truss rod must operate in both directions so that the owner can have it corrected when it needs to be. The bridge saddle should be at mid–height so that it can be raised or lowered. The angle of the neck to the body must be appropriate for easy playability, now in the future. 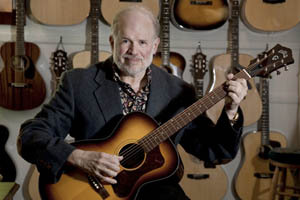 In our opinion – keep in mind that we sell middle–to–high–end instruments to players who actually want to own and use their acquisitions throughout their entire lifetime – each new fretted acquisition should come from a company with a national, if not international, reputation for excellence. Ideally a guitar needs to sound so incredibly good, played acoustically or amplified, that every time it is picked up for practice or performance it renders both the owner and the audience speechless. Yes, I know, this may sound like a tall order for an inanimate six or 12–stringed wooden vessel of vibration – but these are the factors that every buyer must consider before placing the cash on the counter, or, well…the shopping cart. What advice would you give a young guitarist? I have always taken the position that it’s better to save up a little longer in order to get the instrument you really want instead of taking the course of least resistance and buying only that which you have the money for today. The better the guitar, the better the guitarist you have the capability of becoming. When you cut corners on the initial purchase (or even on the second guitar purchase) you are inadvertently setting up barriers which may prevent you from developing the skills required to be successful. So many younger players end up saying “I was never meant to be a guitarist” when in fact the compromised quality instrument that “seemed like a good idea at the time” prevented them from becoming one. When you buy a guitar brand of known reputation, in a model that has traditionally been selected and used by famous working professionals, your learning curve can grow exponentially.